The death on May 4 of Ricardo Portillo in Salt Lake City once again places a spotlight on bad behavior in sporting activities and the abuse directed at officials. For the uninformed, Portillo died at age 46 from injuries he sustained when he was struck on the side of his face by a punch thrown by a 17-year-old goalie in a youth soccer match in a Salt Lake City suburb. He was in a coma for a week before he died. The incident occurred in a game played in an unaffiliated youth league in Taylorville, Utah, a suburb of Salt Lake City. The league is called Liga Continental de Futbol, and it began a few years ago for Hispanic youth in northern Utah. The league was not affiliated with the Utah Youth Soccer Association or with the United States Soccer Federation. Portillo had been a referee for several years and also played on adult teams in the area. 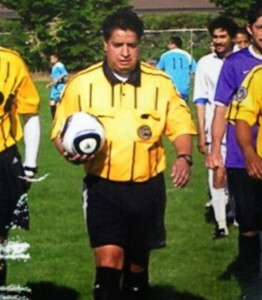 Utah youth soccer referee Ricardo Portillo put into coma by teen player's sucker punk died. Portillo was injured in a game on April 27. He had blown his whistle to call a foul and issued a caution/yellow card for cynically fouling a player who had an obvious goal scoring opportunity. According to witnesses at the game, play stopped briefly. After Portillo showed the player the yellow card and began writing down information, the player started to turn away. However, the player suddenly turned back and struck Portillo with his fist. The blow landed on the side of the face. Portillo initially sat down on the ground and then stood up. He grabbed a nearby person and complained of dizziness. He then sat back down and began vomiting blood. A 911 call was placed, and Portillo was taken to a nearby hospital. The blow apparently caused swelling inside of his brain and he died of complications. The 17-year-old suspect was arrested later that day and placed in juvenile detention, where he remains. He was initially charged with assault. The local prosecutor’s office is expected to upgrade the charges and make a decision on whether or not to charge the teen as an adult. One of Portillo’s daughters told reporters that her father had been assaulted previously while refereeing. He had continued officiating because of his love for the sport, even though he had suffered bruised ribs and a fractured leg in previous assaults. The National Association of Sports Officials provides liability and assault insurance for over 19,000 officials in all sports nationwide. The group has lobbied states to adopt laws making all incidents of assault on sports officials’ felonies. To date, 22 states have adopted such laws. Larry Lauer is the director of the Institute for the Study of Youth Sports at Michigan State University. He told reporters that his group hears about incidents involving poor behavior directed at youth officials almost every week. He blames the problem on the emphasis on winning at all levels of sport and the inability of young athletes to handle the anger without acting out. It seems clear that a certain level of misbehavior by athletes is tolerated in sport. Fights in pro hockey are considered a normal part of games. Fans watch television and see pro basketball players shove and throw punches. They also tune in to baseball games on television and watch as both teams’ players rush onto the field to participate in a fight. The fastest growing sport among spectators is ultimate fighting, which many people compare to licensed barroom brawls. Technology also plays a role in furthering this problem. People are used to watching pro and college games where officials routinely use replay to resolve disputed calls on the field of play. Such technology is not available at the youth sport level. Soccer, in particular, is a very difficult game to referee. The field is larger than an American football field. In football there are six to nine officials on the field, each responsible for one area. In soccer, there are three officials. Two of them are limited to running up and down the sideline on one-half of the field. The majority of the action is policed by one person. A center official may have to run three to five miles during the course of one match. One family today is planning a funeral for a loved one, while another family is contemplating a young life that will never be the same. The games will continue to be played, and Ricardo Portillo will become a footnote in history. On a personal note, I refereed soccer for over two decades. I worked youth matches involving players from age 8 to age 19. I worked adult amateur matches, high school matches and spent five years working college matches. Outside of college matches, there was almost never any kind of security provided at game sites. Being yelled at by fans was a routine part of the game. Complaints from players and coaches were part of every match. I can recall several matches where angry coaches, players or parents confronted me afterwards. There were times when I had to remain on a playing field until people left. On one occasion, I had to tell a coach that I would place a 911 call and summon police if he did not back off. As a youth coach, I had to physically restrain one parent and talk to several others after they became enraged over officials’ calls. We consider ourselves to be a nation of winners. If our team does not win, there must be outside reasons for this. Those reasons frequently focus on game officials. The problem can be worse at youth matches because of the lack of security. It seems that some adults check their brains and their judgment at the park entrance when their children are playing sports. Kids mimic what they observe adults doing. This frequently leads to acting out. Teenagers mature physically before they do emotionally. They see nothing wrong with mimicking what they see their heroes do on television. Today, we briefly mourn for the loss of the Portillo family and for the loss of the young man’s family. Unfortunately, it is likely that after a few days or weeks we will have moved on and the fields and buildings where our children play games will remain dangerous domains. We can only hope that at some point tragedies, such as the one in Utah, will lead to some real effort to change behaviors and attitudes. Winning really is not the most important thing in youth sports.